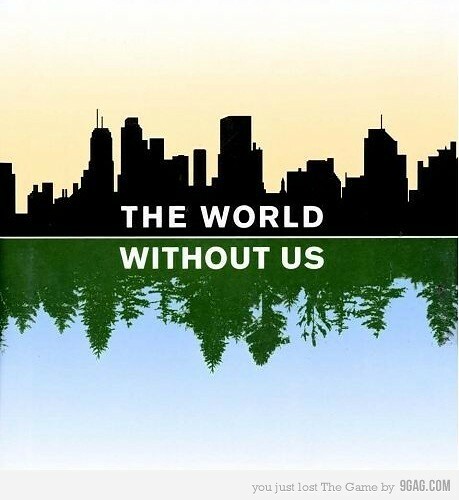 In The World Without Us, Alan Weismann offers an utterly original approach to questions of humanity's impact on the planet: he asks us to envision our Earth without us. The World Without Us reveals how, just days after humans disappear, floods in New York's subways would start eroding the city's foundations, and how, as the world's cities crumble, asphalt jungles would give way to real ones. It describes the distinct ways that organic and chemically treated farms would revert to wild, how billions more birds would flourish, and how cockroaches in unheated cities would perish without us. Drawing on the expertise of engineers, atmospheric scientists, art conservators, zoologists, oil refiners, marine biologists, astrophysicists, religious leaders from rabbis to the Dali Lama, and paleontologists -- who describe a prehuman world inhabited by megafauna like giant sloths that stood taller than mammoths -- Weisman illustrates what the planet might be like today, if not for us. I first heard of the book a few Earth Days ago when it was a free (or discounted) ebook download. I figured it would be a book to hang onto in case I had nothing really to read. I wasn't big on reading non-fiction and it had to be something really good to keep my attention. I started to read the book since I had just downloaded it and soon found myself being one of those annoying people who wants to read you passages from the book their reading. It was common to hear me go "Oh listen to this" or "Did you know...". It was fascinating to read about how the world would possibly break down; how animals and plants would take over what are now major cities; and to think about what would remain. Things like plants that were brought to one location from another could wipe out the indigenous plants of the region. Things like that mean that the world without us would be different than the world before us.